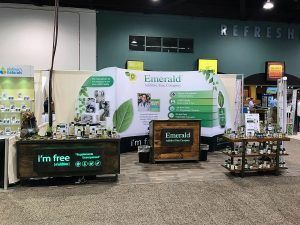 Simpson Industries contacted us after seeing our ad on Google with an idea of how they wanted their trade show display to look. 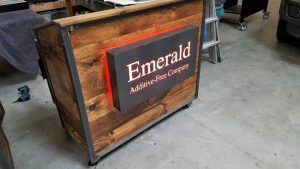 They wanted some signs to go onto furniture that they were going to take to different trade shows that would stand out among the other businesses at the event. They wanted the letters and images to be routed out of a panel that matched the accent on the furniture. After the furniture came into our shop, we looked at the color scheme to think of what would look good. These portable wooden counters have a metal frame so we started with aluminum that we painted a distressed black color to tie the colors together. They wanted the letters to be illuminated so we routed the letters out of the aluminum and backed it with white acrylic. To give the letters a little more depth and dimension, we backed the routed letters with more acrylic. 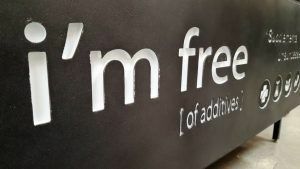 Since the circle icons on the “i’m free” sign had a lot of little details, we weren’t able to route them out easily like we did with the letters. Instead, we routed the circles and actually laid black vinyl in the centers so we could still make sure that the appropriate parts of the icon were illuminated. Not only did we illuminate the letters, we made the signs in a way where the LEDs would also flood out the back to create a colored border around each sign that would match the current color of the letters. To do this, we made the aluminum into more of a box shape than just a flat panel. Each sign is 3 1/2″ deep and backed with clear Lexan which is a UL listed acrylic. We mounted the signs onto the furniture with spacers to give the lights from the LEDs room to create the illuminated border effect. One of the most important features they wanted to make sure the signs had were color changing LEDs. After looking at a few different options, they decided to go with LEDs that could go through all of the colors of the rainbow. This was perfect for their trade show display because the LED colors could be changed by a remote controller, and you can even have pre-set settings where you could customize what colors the LEDs go through, and the speed of the color change. The signs look great with the rest of their display and they are sure to attract a lot of new customers at their future trade shows. With any event signage, you want to make sure that you stand out from other companies while displaying your company name and conveying what it is that your company offers. You can also check out other signs we’ve made for events on our online gallery.